When I think of a cream tea, I think of the summer sun, lashings of cream, homemade scones and jam. The thing is as I sit there spreading homemade jam on warm scones and then a lovely big spoonful of cream on top I feel just a tiny bit guilty dont you?! 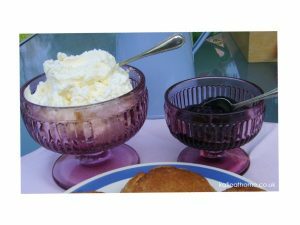 I know I could have a small spoonful of cream, however if I am going to sin then I am going to do it style oh yes! So what I really need is a good excuse ( yes I admit I have had a few recently, Mothering Sunday, Easter . . . ) but what better excuse could we have than a wedding – in fact a Royal Wedding! – does that mean 2 scones and 2 really big spoonfuls of cream! I think so, so here it is a Royal Cream Tea for a Royal Wedding Day, enjoy and have lots of fun. Now scones I am happy to admit that in the past I have struggled with however a little tweeking, a bit of give and take and I am now happy with my recipe. What you will need . .
How to do it . .
Now you have the scones you need some double cream and jam. Mix your cream until just thick – careful not to overdo it, serve in a Cream and Jam set with your plate of scones and enjoy. I hope we will all be enjoying our Royal Cream Tea in the sun in the garden, have fun and enjoy a wonderful day. Reasons to have a cream tea – let me know yours and share them – giving us all an extra reason!